Reserve Your Segway Tour Today When Available. Make Your Day in Maui Special! 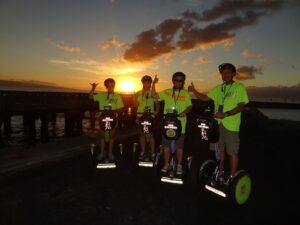 Best Segway® Personal Transporter (PT) Tours on Maui – Discover Hawaii on Segway PT Enjoy the newest and most exciting activity offered in Lahaina, Maui, as you roll around town and visit its historical sites of interest, get great tips on where to shop, dine and chill. Whether you’ve been on one before or this will be your first time, you’ll experience it all and not even break a sweat riding your Segway PT, the ECO bike of the future! The quick tour in Lahaina – only 90 mins. Three hours of FUN with Maui sunset as a bonus. 3 hours – The Best Ocean side tour on Maui! Duration: 2 hours – Family gliding with saving. Segway Maui Tours meet our high standards for providing customers a safe and memorable experience and are recognized as providing the highest quality tour in their area. All of our Segway PT Tours deliver the utmost in safety and training – providing fun instruction, smaller guide-to-glider ratio, and in-depth knowledge of technical and practical usage. Best Segway® Personal Transporter (PT) Tours in Maui – Segway PT Tours with Aloha. Segway on Maui, Segway with us! Private tours are unique One to One Experience – Segway® (PT) Customized Tour based on your creativity. From as low as $399.99 only! Segway® Personal Transporter (PT) Private Tours meet our high standards for providing customers a safe and memorable experience and are recognized as providing the highest quality tour in their area. All of our Segway® Personal Transporter (PT) Tours deliver the utmost in safety and training – providing fun instruction, smaller guide-to-glider ratio, and in-depth knowledge of technical and practical usage. Experience the best of Lahaina in a fresh way – on a Segway PT! Select your favorite photos from your tour and let us print and frame them for you. We take and print high quality digital images with high quality equipment. More fun than walking, more Eco-friendly than driving — the Segway PT is the best way to see Maui! Private check-in and training for your group only. Personal Tour Guide – Experienced guide at your service. Selection of departure times to fit your schedule. Tour route customized to fit your needs, rider ability, previous tour experience and your schedule. Private tours available per your request with 48 hours notice. If you have never tried a unique and unforgettable experience that allows you to ride on a Segway PT – now you can! Take advantage of this great opportunity with us, on the beautiful island of Maui. New technologies that are hidden in the ecological Personal Transporter will take care of your carefree ride through Lahaina, where you will experience the many wonderful sights that you will not want to forget. Don’t be scared! Riding a Segway is as easy as 3, 2, 1! You will be a pro in less then 5 minutes. Especially if you’re new to Maui? A Segway PT is a great way to discover what to see, what to do, and where to eat on the island! When you join our Segway PT tour, we show you the best that Maui has to offer – incredible shopping and dining experiences, as well as entertainment and local art galleries. We share the history of Maui, as well as the rest of Hawaii, as you explore the beautiful surroundings. Choose between riding around Lahaina, or a private tour in Wailea and Makena. If you’re an experienced rider, we can show you the spectacular natural side of Maui – challenging your limits while you roll through gorgeous scenery on Segway PT tour! For those who want to get out of the city and just enjoy the waterfront, we also offer rides through the ocean parks to Kaanapali.